As mentioned I visit the Only Watch 2011 auction in Monaco, and will list the auction results of the 40 watches here below as soon as they’re available. The auction is held September 23rd at 4 PM (GMT +2). Lot 1 : Audemars Piguet, Jules Audemars. Estimate € 35.000,= to € 45.000,=. Result € 38.000,=. Lot 2 : Bell & Ross, BR01 Casino. Estimate € 20.000,= to € 40.000,=. Result € 18.000,=. Lot 3 : Blancpain, Villeret. Estimate € 45.000,= to € 65.000,=. Result € 42.000,=. Lot 4 : Bernhard Lederer, Gagarin Tourbillon. Estimate € 200.000,= to € 300.000,=. Result € 300.000,=. Lot 5 : Bovet, Amadeo Dragon & Phoenix. Estimate € 180.000,= to € 220.000,=. Result € 70.000,=. Lot 6 : Breguet, Grande Comlication. Estimate € 80.000,= to € 120.000,=. Result € 120.000,=. Lot 7 : Celcius, X VI II. Estimate € 40.000,= to € 60.000,=. Result € 75.000,=. Lot 8 : Chanel, J12 Marine. Estimate € 15.000,= to € 20.000,=. Result € 21.000,=. Lot 9 : Chaumet, Dandy Arty. Estimate € 10.000,= to € 15.000,=. Result € 4.500,=. Lot 10 : Chopard, L.U.C. Engine One. Estimate € 50.000,= to € 70.000,=. Result € 35.000,=. Lot 11 : Corum, Golden Bridge. Estimate € 55.000,= to € 70.000,=. Result € 50.000,=. Lot 12 : Cyrus, Klepcys. Estimate € 70.000,= to € 90.000,=. Result € 62.000,=. Lot 13 : De Bethune, 08-01-1297 DB25 . Estimate € 100.000,= to € 150.000,=. Result € 80.000,=. Lot 14 : de La Cour, Mourinho City Ego. Estimate € 15.000,= to € 25.000,=. Result € 7.500,=. 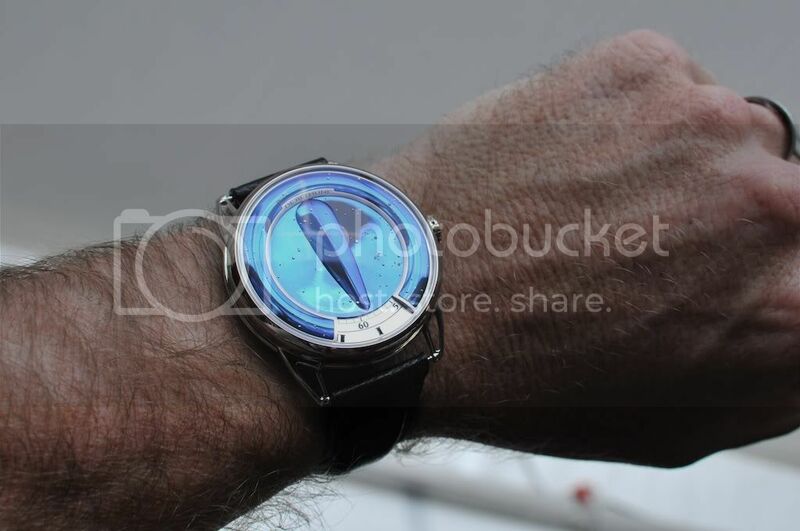 Lot 15 : DeWitt, Concept watch No. 3 X-Watch. Estimate € 350.000,= to € 500.000,=. Result € 410.000,=. Lot 16 : Franck Muller, Crazy Hours. Estimate € 20.000,= to € 40.000,=. Result € 44.000,=. Lot 17 : Frederique Constant, Family Set of Four. Estimate € 13.000,= to € 18.000,=. Result € 22.000,=. Lot 18 : Girard-Perregaux, “WW.TC” Titanium Oxide. Estimate € 25.000,= to € 45.000,=. Result € 29.000,=. Lot 19 : Glashütte Original, Senator Chronometer. Estimate € 30.000,= to € 50.000,=. Result € 37.000,=. Lot 20 : Harry Winston, Midnight GMT Tourbillon. Estimate € 200.000,= to € 250.000,=. Result € 160.000,=. Lot 21 : Hermes, Arceau Le Temps Suspendu. Estimate € 30.000,= to € 40.000,=. Result € 27.000,=. Lot 22 : Hublot, Oceanographic 4000. Estimate € 30.000,= to € 40.000,=. Result € 33.000,=. Lot 23 : Ikepod, Hour Glass. Estimate € 15.000,= to € 25.000,=. Result € 23.000,=. Lot 24 : Jaquet Droz, Petite Heure Minute Monaco. Estimate € 30.000,= to € 40.000,=. Result € 32.000,=. Lot 25 : Laurent Ferrier, Prototype. Estimate € 25.000,= to € 35.000,=. Result € 31.000,=. Lot 26 : Louis Vuitton, Tambour Diving II Chronograph. Estimate € 40.000,= to € 60.000,=. Result € 26.000,=. Lot 27 : Maurice Lacroix, Masterpiece Roue Carée Seconde. Estimate € 8.000,= to € 12.000,=. Result € 11.000,=. Lot 28 : MB&F, HM4 Thunderbolt Flying Panda. Estimate € 170.000,= to € 230.000,=. Result € 170.000,=. Lot 29 : Montblanc, Coll. Villeret 1958 Vintage Pulsograph. Estimate € 40.000,= to € 50.000,=. Result € 30.000,=. Lot 30 : Patek Philippe, Ref. 3939. Estimate € 450.000,= to € 650.000,=. Result € 1.400.000,=. Lot 31 : Piaget, Altiplano Skeleton. Estimate € 25.000,= to € 35.000,=. Result € 54.000,=. 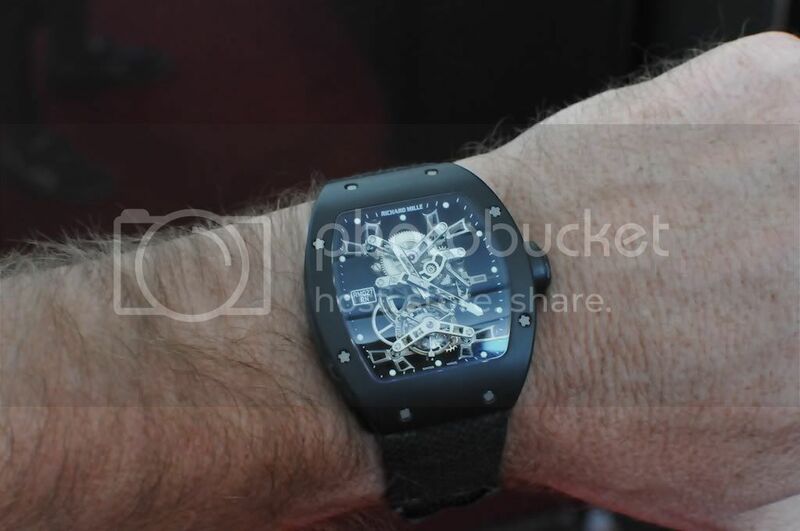 Lot 32 : Richard Mille, RM 027 Tourbillon Rafael Nadal. Estimate € 400.000,= to € 600.000,=. Result € 510.000,=. Lot 33 : Romain Jerome, Rock the Rock DNA. Estimate € 10.000,= to € 12.000,=. Result € 11.000,=. Lot 34 : TAG Heuer, Monaco Mikrograph 1/100th. Estimate € 50.000,= to € 70.000,=. Result € 44.000,=. Lot 35 : Ulysse Nardin, Freak Diavolo. Estimate € 75.000,= to € 100.000,=. Result € 125.000,=. Lot 36 : Urwerk, UR-103 Phoenix. Estimate € 70.000,= to € 90.000,=. Result € 55.000,=. Lot 37 : Vacheron Constantin, Metiers d’Art. Estimate € 80.000,= to € 120.000,=. Result € 90.000,=. Lot 38 : Van Cleef & Arpels, Poetic Complication. Estimate € 100.000,= to € 150.000,=. Result € 215.000,=. Lot 39 : Vulcain, Skeleton Cricket. Estimate € 25.000,= to € 45.000,=. Result € 11.500,=. Lot 40 : Zenith, Set of 2 Captain Chronograph. Estimate € 25.000,= to € 30.000,=. Result € 20.000,=. So a quick addition learns that Antiquorum (the host of the auction) is hoping to fetch a total amount of between € 2.826.000,= and € 4.522.00,=. However except for the Patek Philippe 3939 the overall auction results were very moderate to low though. Only a few watches brought more than the maximum estimate, and quite some didn’t even reach the minimum estimate by far. So the total auction result ended at € 4.543.500,= – just over the maximum estimate ans solely reached by the Patek Philipp. All prices mentioned are without buyers premium and/or taxes, which I’m not sure if they apply to this auction. Of course all eyes were on the stainless steel Patek Philippe which fetched the highest price by far, however my personal favorites, having seen the watches in real two times now and tried some on my wrist, were the De Bethune DB 25 (for it’s extremely beauty and technical craftsmanship), the Richard Mille RM 027 (for it’s unbelievable light weight), the MB&F HM 4 Flying Panda (because it’s around the bend) and the Vacheron Constantin Metiers d’Art (for it’s beautiful dial). This entry was posted on September 23, 2011 at 12:16 and is filed under #womw, all, events, front page, news, reference. You can follow any responses to this entry through the RSS 2.0 feed. Some amazed me really, like the Bovet and the Chaumet. Lucky winners. Euro 4500.- is a steal for the Chaumet. Franck Muller did well, since the watch, auctioned now, is not that different from his Crazy Hours collection. Timeless timepieces playing timely masterpiece tunes at auctions to raise a phenomenal $6.15 million for a worthy charitable mission. Congratulations to all the buyers and contributors of these wonderful watches; and Time as prodigious a word as it is; is now even bigger.